We bring you a sublime and meditative rendition of 21 Gayatri Mantra chants, composed and sung by Saraswati and Sai Ganesh Nagpal. Each chant is bathed in unique, soul-stirring melodies that resonate with the inner harmony a seeker experiences during meditation. The Gayatri Mantra is one of the most potent and powerful mantras from the Vedic tradition. The mantra infuses the singer and listener with vitality, soul purpose and positive energy. This song meditation with the Gayatri chant is meant to take you on a soulful journey. Like a gentle river, the melody brings you into meandering flow, allowing you a glimpse into the inner realms of your own unique awareness. As you listen and meditate, you become an observer, a silent witness to the scenery that goes past as you move closer to the universal heart – the seat of pure love within your own Self. Allow the mantra to quieten you into a meditative silence where you are more connected to, more at peace with yourself. This digital audio track is fully downloadable upon purchase. You can listen to a sample selection from the audio in the Description section below. 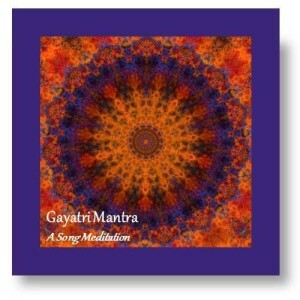 The “Gayatri Mantra – Song Meditation” audio is 18 minutes long. In this sublime song meditation, the Gayatri Mantra is sung 21 times – both these numbers (18 and 21) hold a special place within spiritual sadhana or practice. You can listen to this audio as you meditate, or simply allow the soothing sounds of the mantra meditation to play within your home or working space.